Singapore's Parliament is set to debate the Finance Minister's 2013 Budget statement from Tuesday, and thereafter the Budget allocations for the various ministries. The Government Parliament Committees (GPCs) have been discussing the key issues which Members of Parliament intend to raise during the Committee of Supply. Some of the topics on the cards include a call for the return of dual-key HDB flats to promote togetherness within multi-generational families, measures to address the income gap, reducing stress in schools and allowing students to have their holidays without tests and assignments. Economists and finance analysts on Thursday evening questioned the extent of the progressiveness of government’s proposed budget, noting that there was still a lot more room to increase tax rates for high-earners, in particular. A panel made up of four economists, two finance experts and a tax partner, including forum moderator Donald Low, shared their views at a forum organised by the Economic Society of Singapore on Thursday, with several also expressing doubts over the potential effectiveness of measures to improve labour productivity and help lower-income workers. OCBC Bank’s head of treasury, research and strategy Selena Ling described the government’s efforts at making Singapore’s tax system more progressive as “tinkering at the margins”, noting through charts that the country’s fiscal surplus has for several years been larger than projected. How progressive is the new tax structure? As an open economy, Singapore has to strike a balance between maintaining international tax competitiveness and achieving domestic equity in its fiscal policy. Budget 2013 thus aims for "quality growth and an inclusive society". As the income gap has inched up, fiscal policy is one tool to narrow that gap. Narrowing the income gap is done at both ends: targeting the low- to middle-income worker by redistributing income, and lowering disposable incomes at the higher end by taxing higher incomes and wealth. We are transforming our economy so that we can have quality growth - growth that will provide all Singaporeans a better quality of life. And we are taking further steps towards a more inclusive society - starting with our children, helping lower-income workers, and providing better lives for our retirees. A Straits Times' panel of critics assessing this year's Budget in an online special on Monday described it as balanced, focused on helping the needy and addressing the income gap, even as it seeks to restructure the economy. Said KPMG tax partner Chiu Wu Hong: "This is a balanced Budget. It reinforces the message that the country has to push ahead with economic restructuring and with the initiatives to address higher healthcare costs and cost of living." Mr Chiu was on the panel of five experts in The Straits Times newsroom giving their views as Deputy Prime Minister and Finance Minister Tharman Shanmugaratnam delivered the Budget. While the 2013 Budget attempts to address systemic problems that ail the nation, it continues to fall short, as with past Budgets, of addressing what Singapore really needs. The SDP welcomes Finance Minister Tharman Shanmugaratnam's acknowledgment of the income disparity in Singapore and his effort to tackle the problem through the Wage Credit Scheme (WCS). We note, however, that the Scheme is similar to the Workfare Income Scheme (WIS) in that it pays out to employers to raise wages of workers. The WIS has shown not to be helpful in achieving its objectives as income inequality in Singapore continues to widen despite it having been in effect since 2007. The Gini coefficient has risen in the last few years and continued to worsen in 2012 (from 0.473 in 2011 to 0.478 in 2012). It is always a good idea to give those at the bottom of socioeconomic pile a leg up not with the providing welfare but enabling them to join the middle class or better. We keep doing this for the bottom 10 or 20% and so across the board we keep getting better with each iteration. It is a truly terrible idea to offer welfare to the middle class. Something is terribly wrong with our economy management when the bulk of the population need help. The government has been taking away too much money. Singapore’s government hopes that new subsidies for low-wage workers will fix two problems: pressure on company profits, and income inequality. But in doing so, it will just create new problems later on. The government has offered to reimburse private employers as much as 40 percent of future pay increases for Singaporean nationals who earn below S$4,000 a month. The S$3.6 billion, three-year plan is equivalent to 1 percent of the city-state’s annual GDP. The idea is to lend a hand to struggling employers who are finding it hard to fund pay rises, because of increased rents and curbs on hiring cheaper foreign labour. It should also please local workers, who complain that foreign hiring has kept wages down in the past. In an economy already at full employment, there is little doubt that the subsidy will get used. The tight labour market means employees have strong negotiating leverage. And the benefits will be widespread. About 1.3 million people out of a total employed resident population of 2 million earn less than S$4,000. While that figure doesn’t sound much for such a prosperous country, a household with two such earners can be considered middle class. This year’s government budget will be best remembered by a new spending, known as the Wage Credit Scheme (WCS). $3.6 billion is set aside for this scheme to cover 3 years of use of this fund. Hong Kong is unlikely to follow Singapore's example by raising taxes for owners of the most expensive luxury homes, property and tax experts say. The city-state's initiative is seen as being aimed less at cooling the market than at taxing the wealthy as part of efforts to reduce the income gap. "Hong Kong's private housing market is a lot bigger than that of Singapore, and many people could be affected if the Hong Kong government follows suit," said Jennifer Wong, a tax partner at KPMG China. To further curb hiring of unskilled foreigners, the $650 levy for every worker beyond the approved number for a building project has been upped to $950. Has Armageddon been averted? Or are the pruning measures too late in the implementation? In "Dubai, The Story of the World's Fastest City" author Jim Krane writes that 95% of Dubaians are foreigners, and there were only about 100,000 citizens among the city's 2 million inhabitants in 2009. But swarming immigration extends beyond Dubai, and has left Emrati citizens a minority in every one of the United Arab Emirates' seven emirates (Dubai, Abu Dhabi, Sharjah, Ajman,Umm Al-Quwain, Fujairah and Ras Al-Khaimah). The million or so UAE citizens make up about 15% of the country's total population of around 6 million. In the UAE, citizenship is guarded "like a vault of nuclear fuel rods". Residents who never took nationality after 1971 have no citizenship at all. That's one way to maintain the nationality core. The Republic of Singapore has set aside a record S$12.3 billion for the Ministry of Defence/Singapore Armed Forces, according to the Budget Statement released this afternoon. Defence spending for the 2013 financial year, which starts on 1 April, rose some 4.2 per cent compared to the S$11.8 billion budgeted for FY2012. MINDEF's war chest of S$12,335 million comprises S$11,895 million for operating expenditure and S$440 million for development expenditure. Budget 2013: The end of employment woes? As expected, the 2013 budget covers the much-debated issue of the influx of foreign workers in the country. Indeed, the debate which has opposed those that are worried about their rice bowls being taken away by foreign workers to those seeing measures such as the recent population white paper as “xenophobic” has some very high stakes and needs urgent attention. Acknowledging the fact that “foreign workers now comprise 33.6% of [the] total workforce”, Deputy Prime Minister and Finance Minister Tharman Shanmugaratnam assured Singaporeans that Singapore’s policies will remain guided by the objective of moderating the growth of the foreign workforce and only relying on it when the country has “major infrastructural projects under way,as is the case currently”. 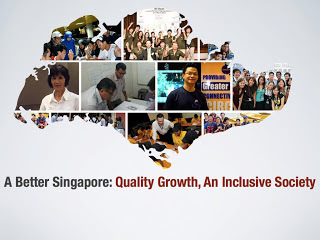 Singapore has broken new ground with a novel scheme to increase the wages of Singaporeans. The government will bear 40 per cent of the pay hike for Singaporeans earning up to 4,000 Singapore dollars (over $3,200) a month. This should benefit at least half the Singaporean workers as they earn less than that. The gross monthly income from work of Singapore citizens and permanent residents working full-time was 3,480 Singapore dollars last year, according to the Ministry of Manpower. The 3.6 billion Singapore dollar Wage Credit Scheme is to help Singaporeans cope with the rising cost of living and reduce the income gap. Under the Budget 2013 measures announced on Monday, vehicle buyers will now have a maximum of five years instead of the original ten years to service their car loans. They would also have to foot a down payment of 40 per cent or more for a new vehicle. And apart from these two, there will be additional increase in registration fee for more expensive cars. If someone were to purchase a car such as KIA’s Cerato forte (1591cc) with an Open Market Value (OMV) of S$12750* and taking the recent COE price announced on the 2nd round of bidding exercise for CAT A vehicles which went at S$78,301. For simple calculation purpose, the individual would have to pay 40% of the total sum of COE and the OMW which comes to be S$36,420 and monthly loan for a 5 year period comes close to a thousand dollars. The scheme is part of a three-year Transition Support Package to help companies restructure. The government will co-fund 40 per cent of wage increases for Singaporean employees over the next three years. This will also apply to wage increases of those earning up to S$4,000 in gross monthly wage. The wage credits will automatically be paid out to employers annually. – Article 14: Why Pay in the first place? – 否极泰来 Piji Tailai: Lee Ang, Can Budget 2013 Produce One? – BLUTA-log: The New Property Tax Structure – Start of a New Direction? – Five Stars And a Moon: Budget 2013: The end of employment woes? Singapore unveiled a budget heavy on social spending on Monday and imposed new curbs on companies hiring foreign workers as the city-state tries to reduce its dependence on overseas labour and address a widening income gap. Singapore, the Asian base for many Western multinationals and banks, has been trying to restructure its economy by getting restaurants and other services firms to boost productivity and curb their reliance on low-skilled foreign workers. The government is also trying to narrow an income gap that is one of the largest among developed countries, and the latest budget included increased subsidies for pre-school education as well as cash transfers to Singaporeans earning less than S$1,900 ($1,500) a month. The Singapore government has earlier today announced the Budget 2013, essentially the government’s vision for how it will allocate its money. This year’s Budget has several focus areas: lowering dependency on foreign workers, raising work productivity, ramping up investments in sports, arts, and innovation, and making Singapore a more sane city to live in for families and seniors. Lowering companies’ reliance on foreign workers - The government has stipulated that the Dependency Ratio Ceiling will be cut further. What this means is that the allowable ratio for locals and foreign workers will continue to shift in favor of Singaporeans. In the services sector, the DRC will be reduced by 5 percent to 40 percent. Singapore has said it will impose more limits on numbers of foreign workers and has called upon businesses to help upgrade skills of the local workforce. The limits include more levies on firms that employ low-skilled foreign workers, a cut in foreign worker quotas and stricter qualification guidelines. Singapore tightened curbs on foreign labor for a fourth straight year and unveiled measures that will raise wage costs for companies through 2015, as the government steps up efforts to increase productivity among businesses. Companies must pay higher levies for lower-skilled foreign employees over the next two years and cut the proportion of overseas workers in some industries, Finance Minister Tharman Shanmugaratnam said in his budget speech yesterday. Singapore Budget: Is the Government Finally Listening? Singapore, the wealthy Southeast Asia city-state, whose government has faced growing resentment over a widening wealth gap and rising cost of living, announced a slew of measures in its latest budget to appease its disgruntled citizens. The government's 2013 budget, which placed greater emphasis on wealth redistribution than in previous years, included measures such as cash transfers for lower income citizens and raising taxes for owners of high-end residential properties and luxury cars, together with making it more difficult to hire foreign workers. These latest measures seem to have gone down well with citizens, who just 10 days go gathered in a rare protest against swelling costs driven by an influx of foreigners. It's no fun being Finance Minister when the Budget is being presented. Rich or poor, everybody has a gripe to justify taking pot shots at Tharman Shanmugaratnam. The folks who gathered at Hong Lim Park made their views felt about the foreign hordes, but the businessmen will be casting the first stones. Overall, foreign workers now account for nearly 34 per cent of Singapore's total workforce. The cold turkey treatment will be rolled out to trim this presence. In the construction and process sector, levies will be raised by $150 between July 2013 and July 2015. A higher levy of $300 will be imposed on workers hired outside a firm's Man-Year Entitlement (MYE). For the services sector, the overall Dependency Ratio Ceiling (DRC - maximum permitted ratio of foreign workers to the total workforce that a company is allowed to hire) will be cut from 45 per cent to 40 per cent. I was lamenting to myself for not putting up more of my thoughts for Budget 2012 because now I find it impossible to compare this one with last year's. In fact until I checked I was under the impression that I didn't blog about it at all. As usual the Fin Min managed to make it look good except in the places which you are more interested and familiar to assess the impact. Wifey and I were discussing this on the way to work this moring: the minimum wage versus the increase in workfare. I said, gotta to make some calculations which I am loathe to do because I need to pause and think how to do it. What’s there not to like about Budget 2013? That depends on what’s your instinctive reaction after hearing/reading DPM Tharman speech yesterday? In keeping with the trend in recent years, the Government has continued to increase social spending in this year's Budget, raising it by almost 10 per cent from 2012. Under the 2013 Budget, the government will significantly increase its spending allocation in the ministries under this sector. AWARE ON BUDGET: WHY ARE FAMILY CAREGIVERS STILL UNRECOGNISED? We are glad that a proportion of the approximately 200,000 families who currently hire foreign domestic workers (FDW) will benefit from the lowering of the concessionary maid levy from $170 to $120. This reduction of the concessionary maid levy will not benefit poorer families who are not able to afford hiring a FDW in the first place, including those where family members are themselves unpaid and unrecognised caregivers. AWARE calls for greater support for women who have left or stayed out of the workforce due to their caregiving responsibilities. Ministry of Manpower figures show that as many as 68 percent of women who are not in the workforce identify caregiving responsibilities as the reason why they are not doing paid work. While we applaud the Government for co-funding 40% of wage increases for Singaporean employees over the next 3 years, as part of the wage credit scheme (WCS), we are nevertheless concerned that only 58 percent of women are currently in the labour force. Concrete measures to expand the female labour force participation rate are needed to ensure that women who are not employed do not get increasingly marginalised in a progressively upgraded economy. The budget was silent on the provision of incentives for promoting flexible work arrangements. Read AWARE’s full recommendations to the Singapore Budget 2013 here. Singapore’s government proposed budget for the next fiscal year offers a significantly more progressive and balanced strategy than before, say analysts in the corporate and finance sectors. Sharing their views in the wake of Monday afternoon’s budget announcement by Deputy Prime Minister and Finance Minister Tharman Shanmugaratnam, experts said the government’s strategy of taxing the wealthy and assisting the poor further will benefit lower and middle-income Singaporeans the most. After the intense debate on the population white paper, Budget 2013 reads almost like a supplementary paper designed to address key issues arising from the population paper. Certainly, Budget 2013 appeared to touch on all the hot button topics of the day, especially those arising from the earlier population debate. Budget 2013 is divided into two major sections — the Quality Growth Programme, and Building A More Inclusive Society. The Quality Growth Program is a $5.9 billion dollar scheme that aims to raise wages and reduce dependency on manpower by tightening foreign worker policies, providing a 3-year Transition Support Package for businesses to adjust, strengthening productivity incentives, and developing capabilities for new growth industries. The core strategy to increase the real wages of lower-income Singaporeans may be fundamentally flawed, because of the assumption that employers will share most of their productivity gains (even if they are achieved) with workers by increasing their wages. With rising costs from higher foreign worker levies in some sectors and jobs announced in the Budget, rentals, Certificates of Entitlement (COE), etc, will most employers share most of their productivity gains with workers? How many times and years have we heard the same story in the Budget, that we will do this and do that and productivity will rise, but it never happen? More stamp duty and motor vehicle-related taxes allowed the Government's revenue for the 2012 fiscal year to exceed its initial estimate. Its total revenue for 2012 was $55.18 billion, which is 3.9 per cent higher than its initial estimate of $53.08 billion. The overall budget surplus was also boosted as a result, to $3.86 billion, compared to an initial estimate of $1.27 billion. A NEW Chinese cultural centre to integrate newcomers to Singapore and showcase the local Chinese identity will be set up by the Singapore Federation of Chinese Clan Associations (SFCCA). It will be a one-stop venue that Chinese community bodies can use for anything from performances and exhibitions to networking events and seminars. The cost and site of the centre have yet to be finalised. Prime Minister Lee Hsien Loong said the Chinese clan associations continue to play an important role in Singapore, especially in integrating new immigrants into society. PM Lee was speaking at a Lunar New Year event organised by the Singapore Federation of Chinese Clan Associations and networking group Business China. Clan associations sprang up in Singapore many years ago to help ease Chinese settlers into a new life here. Singapore President Tony Tan Keng Yam has spoken about the important role clan associations in Singapore play in community bonding and nation building. In a speech at the Singapore Federation of Chinese Clan Associations (SFCCA) - Business China Spring Reception on Tuesday, Dr Tan said that clan groups, together with new immigrant associations, can build and sustain a "uniquely Singapore Chinese identity". He illustrated how in the early years, clan associations helped immigrants to secure accommodation and employment. This enabled the newcomers to gradually become rooted to what was once a foreign land, said Dr Tan. Singapore President Tony Tan Keng Yam gave a speech on Tueday, Feb 12, at the Singapore Federation of Chinese Clans Associations. He spoke about the important role that clan associations played in nation-building and their continued relevance today. More Mandarin should be taught as early as pre-school, and there should be more emphasis on Chinese language and culture throughout the education system, clan leaders said yesterday. They called for more classroom time for the Chinese language, saying it could help Singapore's national development as a whole. More than 100 Chinese clan leaders attended the first Our Singapore Conversation dialogue to be organised by their umbrella body, the Singapore Federation of Chinese Clan Associations. Forget about all the xenophobic hooha cries claiming that foreigners are not able to integrate with Singaporeans. Our very own heartlanders are doing a better job disintegrating the Singapore society. Who are these people? The clannish Chinese Clans. I am not against any party advancing sectarian causes. I take issue when these lobbyists push their sectarian agenda and make it a national cause. As if those who have no links to their cause don't exist! Note that the "unique culture" Singaporeans must have is.... Chinese Culture. Duh. What about the non-Chinese? They no Sinkieporeans, Mr Minister? IS THE PAP USING CHINESE CLANS TO CONSOLIDATE ITS POWER AND PREVENT FURTHER EROSION OF ITS SUPPORT BASE? As we know, Chua Thian Poh who is the President of the Federation of the Chinese Clans is also firmly behind the PAP, having acted as a seconder for Tony Tan during the latter's Presidential bid in 2011. This time, he has come out to attempt to douse the flame over Shanghainese new citizen LiYeming who by the way had the impudence to tell us what constitutes a Singaporean core and lecture us on how to run this country. Chua's logic is baffling. Will he still maintain the same stance if Li was a Singaporean and had criticised the PAP's immigration policy or made some "xenophobic" statements? Would these statements still represent his private views with no consequence for the Federation? By now Li Ye Ming (李叶明) has joined the ranks of the infamous, think Sun Xu et al. A PRC national who moved to Singapore 17 years ago, and signed up for citizenship only recently - shades of the colorectal surgeon who picked up his membership card 3 weeks before contesting the Punggol-East by-election - abused the platform of the Singapore Federation of Chinese Clan Associations to attack a true blue born and bred Singaporean. Poor Mr Li Yeming. In Singapore, the reaction so far over his very public disagreement with Mr Low Thia Khiang appears to have been more of the “I do not agree with you, so I will send an army over to flatten your home!” kind. A quick recap if you haven’t been following the news on this closely. WORKERS' Party (WP) chief Low Thia Khiang has refuted a charge that he was "inciting xenophobia" in his parliamentary speech on the Population White Paper. In a letter to Lianhe Zaobao yesterday, he wrote: "WP's alternative proposal does not reject foreigners. It places importance on economic growth and even more so on creating a sustainable future for Singapore." The anti-foreigner charge came from Mr Li Yeming, vice-chairman of the Singapore Federation of Chinese Clan Associations research and publications committee, in an earlier letter to the Chinese daily. New citizen Li Yeming from PRC has filed a police report against netizens whom he said falsely accused him of making anti-Singapore postings on the Net. He also said in his police report that he did not make those postings, “stating that I scolded Singaporean(s), threatened to flatten Singapore and also commented on how lazy Singaporeans are”. Li Yeming has every right to make a police report but was that a clever move? Of course not. You are now a SG citizen. If you are serious about your citizenship, you want to integrate to add to making a SG Plus. If you are committed to this place you would realize that you have not put in the work expected of you to help your compatriots from China integrate, yourself included. We warmly welcome long term stayers but only if they respect our way of life and want to add to it. Folks like Li Yeming wants to turn this into a mini China. Now the other arrivals e.g., the Indians would by instinct do the same. Eventually we are back to the tinderbox of race relations from where we inherited this place from the British. If this is not stupid, what is? It was an exchange between WP’s Party Mr Low and Mr Lee. Now that Mr Lee has been harassed, why did WP not have anything to say? It doesn’t matter if the harrassment come from WP’s supporters or not, but the fact that WP’s chief is involved, shouldn’t he speak up against such gangsterism? This is consistent to how WP’s supporters behaved during Elections period – ie – threatening other candidates. Nothing new really. Mr Li Yeming, 43, the new citizen from PRC currently at the centre of the storm tendered his resignation to the Singapore Federation of Chinese Clan Associations (SFCCA) yesterday (21 Feb). He was the vice-chairman of SFCCA’s research and publications committee. Earlier, Mr Li had written to Zaobao accusing Workers’ Party (WP) Member of Parliament (MP) Mr Low Thia Khiang and the party of “fanning anti-foreigner and anti-immigrant sentiments during the White Paper debate”. Mr Low later wrote back and rebutted Mr Li in Zaobao, categorically denying it. Mr Low said he was shocked that Mr Li had accused him of “inciting xenophobia”. 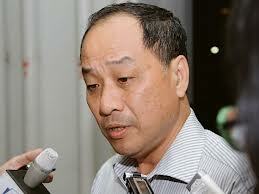 Mr Low said Mr Li had selectively interpreted his speech and the WP’s parliamentary proposal. Mr Li later counter-accused Mr Low of taking his words out of context. IS THIS THE NEW CITIZEN FOR SINGAPORE? He shoots his mouth without realising that he is attacking Singaporeans with his insensitive statements. Even when a kind soul tried to advise him gently, he simply does not understand. Is this the kind of new citizens we want ???!!! Do note that the Chinese clan led by Li Ye Ming is appointed by PMO (Prime Minister’s Office) to integrate more PRC to be like him. This is the example of new citizens we have. I was deeply touched when I saw the headline "Building A Flourishing Population and A Sustainable Singapore” with Low Tia Khiang’s name clearly in sight in February 18 "Lianhe Zaobao”. Any Singaporean would love to see a bright vision. I eagerly read the full text, but unfortunately I could not find any specific proposal in the content. The content clearly did not live up to the headline. How I wish Mr Low would be putting forward something concrete proposals. After all, this Population White Paper affects the future of Singapore, our future. I respect Mr Low’s logic. The reason why he has such fear obviously could not be due to me, who is just one new citizen. In fact, he recalled in his article his past where he had indelible fear, a fear which he called the "White Terror". I am not ignorant of the period of history Mr. Low mentioned. But the world has since progressed, and new history is being written. Singapore has undergone one "watershed" after another. Having won a series of election campaign, and becoming the largest opposition in the Parliament, the Workers’ Party is now the darling of the day. Many concerned friends have even asked me, “Would you get into any trouble?” for me to write something criticising the Workers' Party and Low TK’s article at this point in time. I originally wondered if my friends were unnecessarily "frightened". But now I realised their concern is not without basis. For Mr. Low to characterise me as "wanting to cause the Workers Party to die/death", I suspect he is trying to incite discontentment among his supporters on me. Does he need to resort to inciting tragic, on this discussion between us? Oh no! I used the word "incite" again, would this invite more ‘spanners’ thrown at my direction? Fortunately in today's Singapore, we have a healthy democratic society based on the rule of law. I should not have to worry about such "alarmist". Frankly, I was very admirable of Mr Low’s courage in entering politics under the difficult circumstances in those days. But shouldn’t Mr Low leave his grief behind, and start debating issues based on current democratic line of thoughts? Only then perhaps the issues could be discussed in a more rational way. And I believe only by leaving one’s grief behind, one can then embrace a better future. LI YEMING says: If you don't speak chinese to a Tiong you are NOT CHINESE! 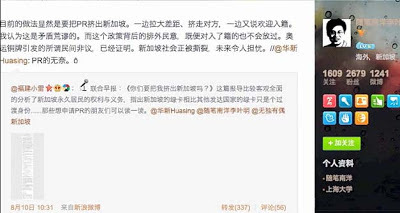 "在中国人面前不说中文.... 我一定回敬他：no i'm Chinese, so you are not Chinese"
Wa that LI YEMING (李叶明) say if you refuse to speak chinese to a Tiong, you are NOT CHINESE leh! liddat then KFC how? Is KFC our second minority President in a row??? Strong rhetoric but ridiculous logic - The Workers’ Party (WP) is saying that the Population White Paper will dilute the Singaporean core. But how so? According to Mr Low, that is because the proportion of non-citizens would go up and allowing immigrants to become citizens is also a form of dilution. But I do not understand. Hiring a domestic helper will not change the core of a family, so how would hiring a few more domestic helpers and foreign workers dilute the Singaporean core? For those of us who are against xenophobia, we are dismayed that it has surfaced in the past few years. Singaporeans, being the children and grandchildren of immigrants, are generally not xenophobic and we have welcome foreigners in the past when they came in at a sustainable rate. B ad policies in recent years have led to negative effects that have caused Singaporeans to be angry. Many have directed this anger at govt policies that they feel should be changed. Unfortunately, the mainstream media, the PAP and staunch PAP supporters have often pinned this term "xenophobic" on opponents of PAP policies. The latest episode is the accusation that WP's Low Thia Kiang had incited xenophobia by speaking up against the White Paper. Can you beat this? Foreigners here accusing our MP Low Thia Khiang of xenophobia! No, worst, inciting xenophobia. This is serious and anyone doing so can be arrested, mind you. We are only 3.3m people, including many new citizens in this 3.3m. In fact the number of true blue Sinkies are much lesser than 3.3m, and our population is 5.3m. How many foreigners are there in this island? And we welcomed them. But their presence is getting to become more of an annoyance and irritation. The people are angry but still tolerating. Singapore Federation of Chinese Clan Associations' Vice-Chairman Li Yeming accuses WP and Low Thia Khiang of "inciting xenophobia"
The Real Singapore The Straits Times reported yesterday (19 Feb) on a new citizen who was originally from PRC, Mr Li Yeming, making a charge that WP’s chief Low Thia Khiang, was “inciting xenophobia”. Mr Li, who is also the vice-chairman of the Singapore Federation of Chinese Clan Associations research and publications committee, accused Mr Low and the WP of “fanning anti-foreigner and anti-immigrant sentiments during the White Paper debate”. His article was first published on Zaobao. The Singapore Federation of Chinese Clan Associations, in fact, has very close-tie with the ruling PAP Govt. On its website, it listed PM Lee Hsien Loong as the patron of the Governing Council of the Federation. Year Of The "Black Water Snake"